Gunung Agung in the sunset with the sulphur tinge creating an almost magic red colour. Photograph by PVMBG. This week there are three volcanoes worthy of attention. So, I thought I would write a brief update on them since we have covered them either recently, or in detail. Without further ramblings let us go on to Gunung Agung. And as I came to my final and third volcano life coughed up a fourth volcano doing something unexpected and I had to rewrite the end, but more about that below. Since I last wrote about Agung the plug has cracked and highly viscous lava have started to extrude out of the vent. Around it we can see steam coming out, but there is by now far less tephra, even though there are intermittent blasts of it. Current Image showing the extruding lava inside the caldera. Seismicity remains high, but at a lower level than prior to the onset of eruption. The tremor and types of earthquakes are typical for a volcano that is charging for an eruption, and it is almost certain that a more powerful phase will come in the end. So far, the eruption of Gunung Agung is following the historical pattern from 1963. If that patterns hold true we should be seeing a more intense phase in the latter half of December. But, it could in all fairness happen at any time. A collage of tasteless selfies by various tourists. Meme by unknown. What amazes me is that such a large number of tourists are taking very complicated selfies of themselves close to the volcano. They are posting detailed pictures of them doing anything from yoga, to dancing tango, in front of Agung. Some of them also make rude remarks about the locals fleeing the volcano, writing things like “it is only puffing” and some such. Well, if the locals are evacuating it is due to the not so small fact that the local scientists and authorities darned well know what they are doing. So far, the monitoring and mitigation have been done in a beautiful style, and there is no reason to assume that it will not be done so in the future. So, if you are a tourist in the area, recognize that this is a potentially deadly event and that the volcano can indeed kill you if you do not follow instructions. Photograph of the developing cauldron at Öraefajökull. This angle is showing the glacial outflow area. Image from Ruv.is. It is easy to become overly excited when you read that the volcano of Öraefajökull has had its largest recorded number of earthquakes, or that a magmatic intrusion has occurred at a depth of 6 kilometres, or that hydrothermal vents have started to melt a large cauldron in the glacier covering the caldera. To put this into perspective we must though remember that Icelandic volcanoes typically suffers up to ten thousand earthquakes prior to an eruption, or even more. So, on the earthquake count this is not much more than a “hello, I am alive” call. The same goes for the intrusion. This one is small by Icelandic standards, for instance it is far smaller than the final Eyjafjallajökull intrusion (there was at least three intrusions). Currently to little magma has risen to be able to cause an eruption on the scale that we do know that Öraefajökull most often suffers. And in regards of the hydrothermal melting of the glacier. So far a round disk a few hundred meters across has melted down to a depth of between 25 to 30 meters. This should be put into perspective that the caldera is a bit more than 4 kilometres across and that it is about 500 meters deep. What is though new in the news is that the cauldron is still growing, and that it has taken on a more drop like shape extending towards the glacial outflow area. This is quite natural since the ice would become less viscous as it heats up, and that it would be starting to flow more easily out of the caldera. This causes a bit of a risk for those who are close to the glacial outflow area. It also means that there is a slightly larger risk that a jökulhlaup will occur. Even though Öraefajökull is still a bit of a chill pill, I am quite convinced that it will erupt within the next decade or so. That assumption is based both on known historic behaviour prior to onset of previous eruptions, and also on the slowly escalating signals that the volcano is putting forth. As with any volcano in Iceland, activity can ramp up quickly. But, it is not until you start seeing that tell-tale large earthquake swarm that an eruption is around the corner. But, when it erupts I full on expect to see a Red bull-sponsored video of someone paragliding into the towering ash column, never to be seen again. The steaming top of Hekla. Photograph by Borkur Sigurbjörnsson. Hekla has a reputation of being the ultimate Viking volcano. It wakes up, have a mead breakfast, and go full on berserker while barfing all over the place. According to instrumental records from the last few eruptions this indeed seems to be the case. You have a brief minor earthquake swarm lasting between 32 to 90 minutes and off she goes. It has though been my opinion that Hekla has the same precursor activity as other volcanoes, just that they are quite quieter than your average run of the mill volcano. Hekla Summit Multigas plot from Heklacafé for the last 90 days. Image from Icelandic Met Office. During the last 6 years the Icelandic Met Office have diligently been upgrading the network around Hekla. They have replaced old seismometers with brand new ones, and they have also expanded the network substantially. Image 1/4 timeline of activity. Image by Icelandic Met Office. There is even a dedicated seismometer called Fedgar and a GPS called Heklukriki that are so close to the volcano that it is unlikely that they will survive onset of an eruption. Fedgar together with the new Mjoaskard seismometer are there to hunt these elusive precursors that might be coming out of Hekla. The third new station is called Hestaalda. Image timeline 2/4. Image by Icelandic Met Office. All of these improvements, extensions and closer placed seismometers has created a network that is more than ten thousand times more sensitive than the network during the year 2000 eruption. Image timeline 3/4. Image by the Icelandic Met Office. And then the long waiting started as Hekla showed nothing suspicious. Until three days ago when Hekla had a small swarm of earthquakes. None of the earthquakes was out of the ordinary. It is what happened that was so small that it was not possible to locate them as discrete earthquakes that is exciting. Image timeline 4/4, the big ones are Skjaldbreidur. Image by Icelandic Met Office. All of sudden there was small signals detected that looks quite like what we see prior to an eruption at volcanoes all around the world. 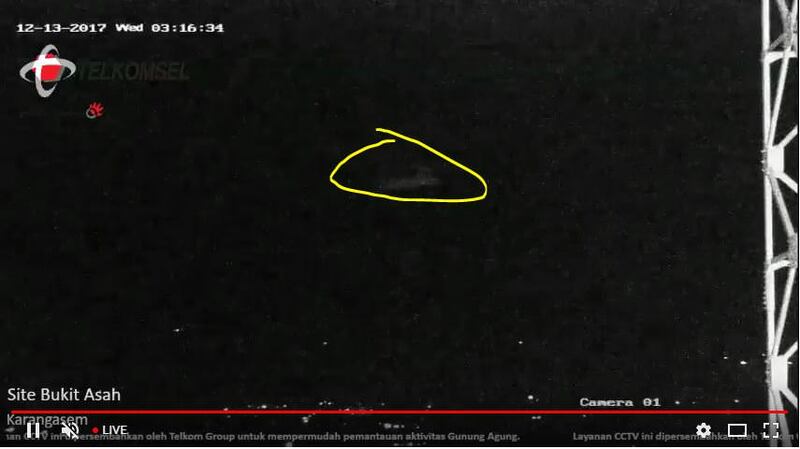 We see them at Öraefajökull, and we see them in far off Gunung Agung. And now we have seen them at Hekla. Are these signs of an eruption coming closer? Well, thing is that we do not know for sure. We just simply do not have a record of anything similar at Hekla. It will most likely be only in hindsight after the next eruption that we can pinpoint what are the precursors of Hekla, or not. What we do know and can compare is the number of earthquakes above M0.8 with what happened prior to the 2000 eruption. And we can see a pattern where these larger earthquakes have increased a lot over the last few years. And that we do know was also the case in the last few years of the previous millennium. Panorama over the crater. David is looking down from the side. The crater is much bigger than it looks, David and his car are only 100 or so meters apart, standing on the north side. Photograph by our commentator Boaworm. Skjaldbreiður is Iceland’s largest shield volcano. It erupted about 9 000 years ago in an eruption that took about 100 years. During that eruption roughly 50 cubic kilometres of lava was erupted. The lava flows reach all the way down to Thingvellir. Quake stack produced with some boonfangled new toy that the whizards of VC has made all of a sudden while I looked away. Image made by Beardy Gaz. The volcano is believed to be a part of the Prestahnúkur volcano. But that is not ascertained since Prestahnúkur is a rhyolitic volcano and Skjaldbreiður was a pure basalt eruption. Skjaldbreiður lies across the Western Rift Zone in Iceland and has been torn and twisted due to seismic forces during the last 9 000 years. But, as with any other volcanic feature in Iceland it is often hard to see if an earthquake swarm is volcanic or tectonic. In this case it seems to have started off as a tectonic swarm. But the location is where there presumably would be a residual magma reservoir after the large eruption. The earthquake swarm is also directly below the main crater. One possibility would be that this is neither a tectonic, nor a volcanic, earthquake swarm. It could also be induced by crustal deformation stress caused by the weight of Skjaldbreiður pressing down the continental crust. Another explanation could be that this is caused by old magma that is shrinking due to heat loss, perhaps in combination with crustal deformation. It is though good to remember that magma is never far off in Iceland, and large tectonic swarms tend to turn into dyke intrusions over time. If that happened it would though not be a sign of an impending eruption, it would just be Iceland doing what Iceland is all about. And that is transporting magma into the crustal layer. Drumplot for Skjaldbreidur. Image by Icelandic Met Office. An if not, we would still need to wait for that ten thousand earthquake rich swarm before an eruption would indeed happen, and we are not even remotely close to that yet. And we have a nice mess on the seismo plot: a rain event, mining, and a series of explosion all in the same trace. Over the past 24 hours, I count 61 explosions on the trace, plus roughly 15 very small events that lack the initial bang. I think the rate has been fairly constant over the past few days. That number is consistent with the histogram on the magma webpage, where yellow indicates explosions. Curiously, the total number of recorded events seems pretty constant over the last few days, but the proportion of explosive events is increasing day by day. A simple question from a newbee. Regarding a volcano like Öraefajökull and magmatic intrusions. With last eruption being some 300 years ago, could some buildup have happened prior to instrumentation and measurement, that we wont know about? Or put in another way, do old intrusions loose energy and become unimportant in this time-frame? I suppose that would depend upon the condition of the old magma. The surrounding rock will insulate it pretty well, so I would imagine it will retain a good deal of its heat over very long periods of time. Other things may happen whilst it’s sitting there in the chambers and pipes of the system, such as interaction with water, or with other minerals,and I imagine that it may become degassed over time. But there seem to be many examples of old magma playing an active role in eruptions. A new intrusion will certainly raise the temperature for example, and if I understand correctly, the current unrest within Agung has shown one way in which old magma can be forced to the surface by such an event. As a recent example proved. It is 9 000 years since the last eruption of Skjaldbreid, but during the recent intrusion we discovered that there indeed is a magma reservoir that is alive and kicking. I guess yellowstone has to be an example too with all the activity there now driven by magma that is probably mostly 70000 year old. 1) What is the average time between eruptions in the langjokull/thingvellir area? I know its obviously less than elsewhere as there has apparently been only one historical eruption there in 1000 AD (the ‘christianity eruption’), but given this recent activity it could be the very early start to more proper volcanic activity later in the century? I found a paper on the area that says most of the lava at thingvellir is early holocene but much of the lava further north is younger and some is ‘recent’. Basically what im asking is whether an eruption might happen in the west volcanic zone in the next few decades/this century. 2) I also was reading the repost of your old article about theistareykjarbunga volcano, and in it you mentioned that it was inflating and that it will probably erupt and that said eruption might be big. Is it still inflating? 3) has there been a year in iceland where more than one eruption has happened from different volcanoes? Eruptions happen near Langjokull every 1000-2000 years on average. Usually these are shield volcanoes or fissures. About 10-15 of them in Holocene. One rifting fissure almost started in 1784 but failed. So the likelihood of one starting is low but it does exist. Last eruption was around 1000 AC, a shield volcano forming near west side of ice cap. Must have been quite a sight. In 1725, 3 eruptions in same year. Hekla, Vatnajokull and Krafla. So this possibility exists but it’s rare. Probably this also happened in 1341. One year with two eruptions is more common. It happened in 1980, 81 and 84, as Krafla erupted and so did Hekla and Grimsvotn, but eruptions were short and did not happen at same time. In 1929 it happened too. And in 1910 two volcanoes were erupting at same time in Vatnajokull! Im guessing the shield volcanoes like skjaldbreidur would have been like the eruptions in hawaii now, only snowy and with no-one there to watch them (except maybe that last one, if it was long lived someone probably saw it eventually). I wonder if grimsvotn will form a lava shield/ big lava eruptions when vatnajokull melts. It is important to recognize that most shield building eruptions occurred directly after deglaciation, and that it was major isostatic rebound that caused them. There is only one minor shield that was constructed after that, a minor one 3500 years ago. All of them are mono-genetic except Urdarhals that sprouted a minor flow from a second vent. Unknown when. The riftings of the Western Volcanic Zone are not volcanic per see, but they could cause an eruption. Theystareykir was massively inflating from 2008 until 2014 when it stopped inflating. It will probably erupt sooner rather than later since it has entered it’s cycle time of eruptions. The last dual eruption in Iceland was in 1996 when both Gjálp and Bardarbunga erupted. The Bardarbunga eruption was a small intra-caldera VEI-2 that has been rather forgotten due to being overshadowed by the massive Gjálp event. It is though a canonical eruption on the IMO list. If I would name one spot to sprout a shield during deglaciation of Vatnajökull it would not be Grimsvötn. My bet would instead be Greip on the northern end of the Grimsvötn fissure swarm. Returning to Skjaldbreidur. Almost all of the lava at Thingvellir is from the eruption that caused the shield to form. That is the infamous lava flow from early holocene. I would also be rather careful about separating Thingvellir and Langjökull. Thingvellir’s closest volcano would be the massive Hengill and not anything associated with Langjökull. I would also be careful to separate Skjaldbreidur from Langjökull. So skjaldbreidur is actually its own volcano ? I guess since holurhaun erupted from bardarbunga, inside what was at the time considered part of the askja fissure zone, after first going into unknown territory, the range of where eruptions can happen in iceland and where one volcano ends and another starts might be a little bit blurry now. Also, have you seen this map? Its basically a really good geological map of Iceland and all holocene lava flows are pink or sometimes yellow (or light coloured if historical). It’s has been noticed, been a bit busy to comment most of the time recently. It’s in my favourites to revisit once I get the time to do the Icelandic feature map (or integrate into Tommy’s vcmap project). What is this ‘icelandic feature map’ you speak of? Is it for the interactive map that was recently added? Or is it classified until further notice. It was a project I started earlier this year, a few snippets are in the articles I wrote. It was going to be an interactive map of everything volcanic in Iceland, but it’ll get amalgamated into the vcmap project once I get time. But to be fair, I backtracked and found a paper stating the same thing. A deep reservoir with a magma chamber at around 6-4 km depth. If there is a magma chamber at only a few km depth under skjaldbreidur I wonder why it hasnt erupted at a later date since its formation, unless most of the eruptions around the north of the lake were incorrectly identified as eruptions from langjokull. It is as far as known completely monogenetic so far. But, it was interesting following a dyke intrusion into a monogenetic shield volcano. Though IMO officially consider the swarm as tectonic and not related to an intrusion. Anyway, does that paper confirm that it’s definitely independent of Prestahnukur? It definitely started as a tectonic swarm. But, as always with Iceland the difference is moot. In this case the tectonic earthquakes formed a perfect quake stack and then took the shape of an expanding magma reservoir. There was also after a while a couple of earthquakes associated with magma movement. We have seen this many times, tectonic swarms turning into something different in the end. Just to much magma sloshing about just waiting for a nice crack to slide into. Yes, the paper was pretty adamant about it. It kind of destroyed my fun with finding the reservoirs independently, but at least me and Andrej got there independently. Now this appears new: the entire crater rim is subtly illuminated (yellow circled area). Oh, I knew that, but most of the time it has been a discrete point along the rim. This is the first time I’ve seen the whole rim illuminated. Could just be more moisture around making the reflection more general than discrete.